Dr. James Gibbs, a professor in the ESF Department of Environmental and Forest Biology and director of ESF's Roosevelt Wild Life Station, has been named a SUNY Distinguished Professor, the highest faculty rank in the SUNY system. Gibbs is an international expert in conservation biology. His career comprises nearly 25 years of academic excellence in scholarship, teaching and creative activities. He has produced 120 peer-reviewed journal publications and five widely used books. He joined the faculty at ESF in 1997. The honor was announced Wednesday after being approved by the SUNY Board of Trustees. Gibbs was one of only 10 faculty members from throughout the 64-campus university system to be elevated to the rank of Distinguished Professor. "Those honored with the distinguished ranking are truly the best of SUNY's best, and they are to be commended for passing knowledge on to and mentoring the next generation of faculty and students in a manner that is as innovating as it is engaging," said SUNY Chancellor Kristina Johnson. ESF President Quentin Wheeler highlighted Gibbs' scholarship, creative activities and skills as a teacher. "Dr. Gibbs is an exemplary teacher, scholar, scientist and colleague. He has distinguished himself in many ways, but perhaps none more than in conservation research and scholarship," Wheeler said. "He is a superb teacher and internationally recognized researcher working at the leading edge of conservation biology. Few scientists have had greater or more diverse impacts saving species, from snow leopards in Asia to Darwin's tortoises in the Galapagos and the reptiles of New York state. "But most importantly, Dr. Gibbs is recognized for his excellence as an educator. Through his teaching and mentorship of graduate students, he has and continues to inspire and prepare the next generation of conservation scientists. That, like his research, will have a lasting and impactful legacy around the globe." 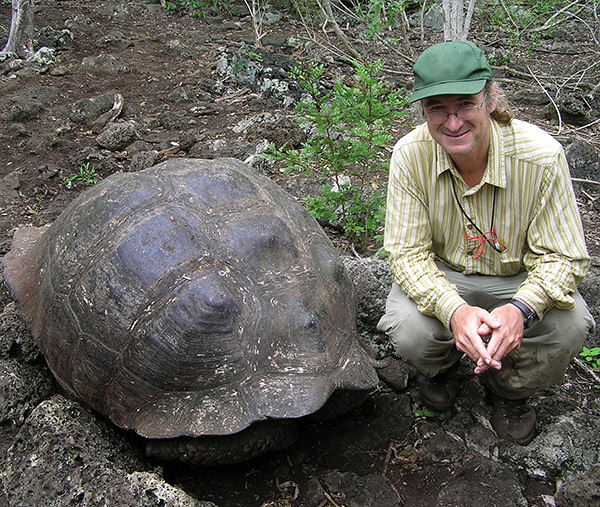 Gibbs is internationally known for his research in the Galapagos, especially his work on giant tortoises. He was chosen by the Ecuadorian government to accompany the frozen remains of Lonesome George, a tortoise that became the international face of conservation biology, from the Galapagos to the American Museum of Natural History in 2012 so the animal could be preserved. Gibbs is also renowned for his work with snow leopards in Siberia. He has been the principal investigator for more than 80 grants and contracts worth millions of dollars. He typically publishes 10 or more peer-reviewed articles annually in leading journals. He leads his department in science citation indices, indicating that his scholarship is widely cited by colleagues and has a significant impact in the field of conservation biology. He has mentored 35 graduate students as major/co-major professor and seven post-doctoral fellows. In addition to his research and teaching, he has served in an array of prestigious positions internationally, including as an international scholar with the HESP Academic Fellowship Program (Russia-Ukraine-Moldova), Soros Open Society Foundation; a member of the external evaluation committee of the Instituto Ecologia in Mexico; vice chair of the Altai Assistance Project, partnering in an effort to achieve sustainable development in the Altai region of Russia); a contractor with the Charles Darwin Foundation; and a contractor with the National Environmental Management Council in Tanzania; and a participant in the United Kingdom National Environmental Research Council/Imperial College/Zoological Society of London. Gibbs received his bachelor's degree from the University of Maine at Orono, where he studied wildlife management. He earned his master's degree in biological sciences from the University of Missouri and his doctorate in forestry and environmental studies from Yale University.